Using advanced simulation and experimental technologies to define manufacturing processes for composite materials. Composites are lightweight and strong and we have made critical contributions to their adoption in numerous sectors – especially aerospace. Designing the digital systems for robotic control, sensory feedback and information processing and developing new mixed-reality methods for human-robot interactions. Defining process and material technologies for AM, or 3D printing, across multiple sectors (aerospace, scientific research and health), with a niche focus on e-beam technologies. Developing state of the art simulation technologies to support precision machining. 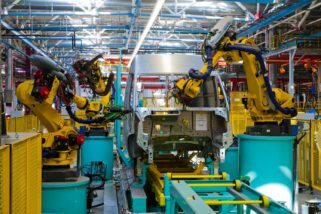 These are the cyber-processes that enable machining to be simulated and optimized ahead of the operation on the factory floor – reducing risk, defects, costs and overall time to product. Developing the digital models for the processing of lightweight metals for automotive, aerospace and other high technology sectors, with a particular emphasis on titanium, aluminium and high performance alloys. Developing the discover of science to bring novel materials into mainstream production processes in a fraction of the time that it takes today. Using complex computational models to build a “digital twin” of advanced materials, and their behaviours, as they are turned into the products of the future. Our industrial footprint covers over 160 companies, including the manufacturers of more than half the world’s automotive fleet, including two of the top three producers. We work with three quarters of the world’s top-20 aerospace companies, including all three of the top manufacturers. Two of the world’s largest steel companies are amongst our long-term relationships, so is the world’s largest manufacturer of titanium, as are two out of three of the world’s largest producers of aluminum. Many of our partnerships are fully international. Within Canada, we work extensively in the aerospace sector (e.g. Boeing, Bombardier, Pratt & Whitney Canada, Avcorp, ASCO Aerospace), automotive (e.g. GM, Ford, Toyota, Linamar and Magna), energy (e.g. TransCanada), marine (e.g. Seaspan), clean energy systems (e.g. Mercedes Benz fuel cells, Ballard, AFCC) the Canadian primary metals sector (e.g. Rio Tinto). Titanium is a difficult metal, it breaks the tools that cut it. By developing a novel digital machining system for jet engines, within a matter of months, a productivity improvement of 30% was achieved, and over the next 6 years, machining cost had been reduced by some 70%. Steel is strong, but heavy. Lightweight alternatives – like magnesium – must have comparable production benefits. Forming small shapes is usually relatively straightforward, but forming the large shapes that make up vehicle body panels can be extremely challenging. UBC proved it could be done.